Dr. Patrick O’Connor and his wonderful team invite you and your loved ones to receive comprehensive, charismatic care at our office. Our La Habra dental team does everything we can to ensure you leave our practice with improved oral health, aesthetic, and function. With a gentle hand and a keen eye for details, our dentist helps bolster patients’ confidence by giving them the smile of their dreams. At the dental office of Patrick O’Connor, DDS, we help encourage children to maintain their teeth and gums, we enhance the smiles of young adults, and restore missing teeth for our elders. 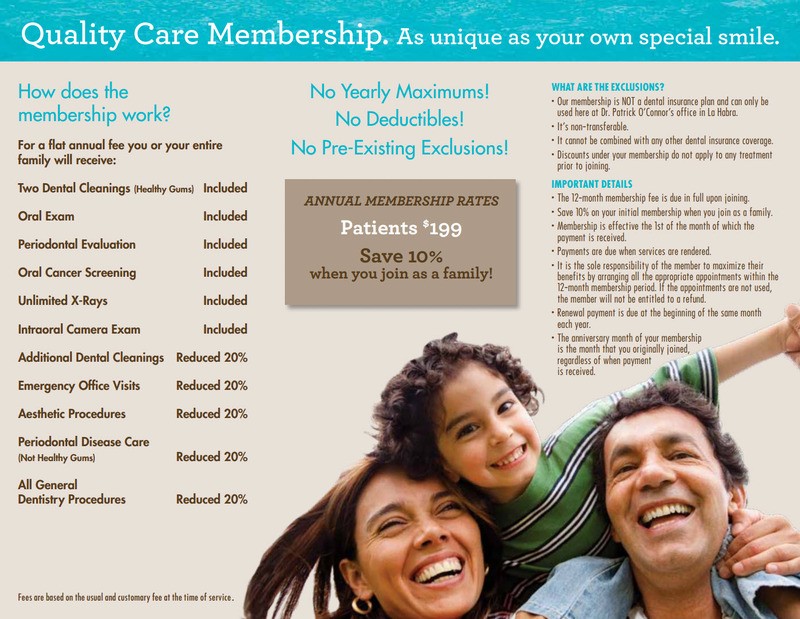 We care for the whole spectrum of family dentistry and make sure every patient is comfortable when receiving treatment. For those seeking to improve their smile’s aesthetic, function, or oral health, Dr. O’Connor sits down with them and talks about the goals they wish to reach. Our dentist is very informative and friendly, making patients feel as if they can ask their questions or voice their concerns without feeling scrutinized. When you or a member of your family enters our practice, they are met with a warm and calming atmosphere as well as a friendly staff who takes the time to learn your name. Our team is happy to see you and will ensure you immediately feel welcome when you walk through our office doors. We are all excited about our jobs and enjoy watching children and adults receive exceptional dental care that meets their needs and exceeds their expectations. We encourage patient and staff interaction as this helps form bonds and can ease the minds of those who are anxious regarding treatment. Dr. O’Connor and his team take pride in what they do and make sure that while the practice is kept nice and clean, it remains homey so patients can relax. We want you, your children, and your parents to become a part of our dental family, where we treat you like how we would want our loved ones to be cared for. Come meet Dr. O’Connor and his staff and learn what dental services would best benefit your smile! Contact the office of Patrick O’Connor, DDS, we help those in La Habra, Fullerton, Brea, and other surrounding communities!